An interview with Jenni Grover and Caryn Feldman, Ph.D. about how boundaries can strengthen relationships. Caryn Feldman, Ph.D. is a licensed clinical psychologist at the Shirley Ryan Ability Lab (formerly Rehabilitation Institute of Chicago), Center for Pain Management. She is also an assistant professor at Northwestern University, Feinberg School of Medicine, Department of Physical Medicine & Rehabilitation. Caryn received her Ph.D. in clinical psychology from the University of South Carolina, where she became interested in health psychology. For 24 years, she has worked with those suffering with chronic pain and co-morbid conditions. Professionally, she is interested in the application of mindfulness strategies to chronic pain. She is a huge fan of ChronicBabe. Jenni: Hi everyone! Today we are talking about boundaries. This talk is part of Lesson 4 and with me today I have Caryn Feldman, PhD. She’s a clinical psychologist with the Rehabilitation Institute of Chicago, Center for Pain Management. Caryn works with all kinds of folks who have all kinds of chronic pain conditions, helping them with all kinds of strategies to manage their pain. I’ve known her for more than a decade and WOW have we talked boundaries. So she’s got a lot of great strategies and ideas for you today. Welcome, Caryn! Thanks for being with us. Caryn: Thank you for having me! Jenni: Awesome! I’m loving doing these talks; it’s just really fun to get perspective from all different kinds of people. 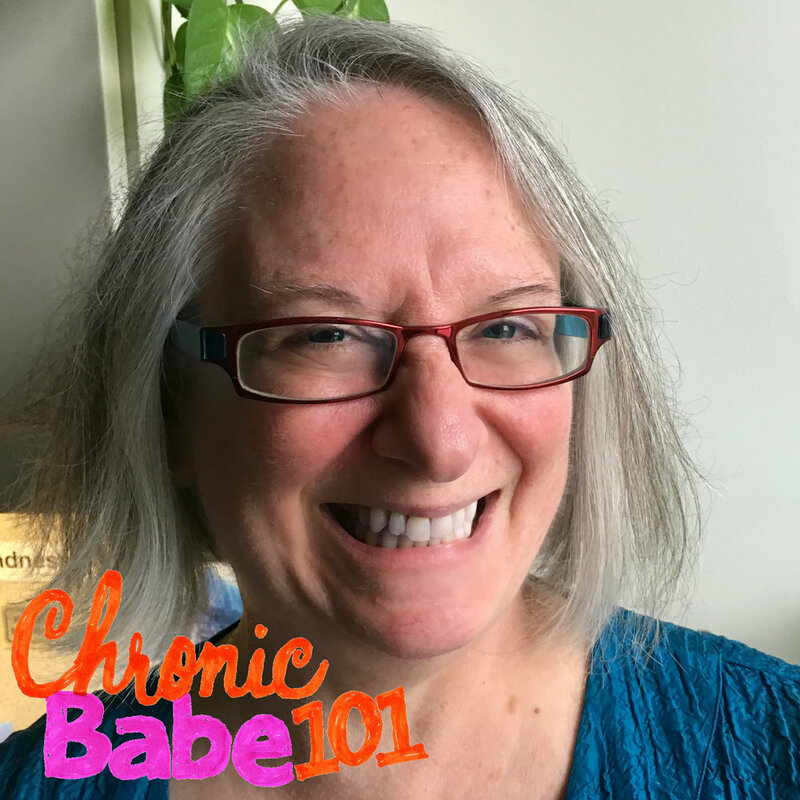 I think it’s nicer than just having the ChronicBabe 101 book with just have my voice; I like bringing in all different kinds of folks, so I think it’s going to be a big benefit for folks. Let’s start with the basics, for newbies. Can you tell me, what are boundaries? I mean, what does that word really mean and why do we need them and why are they important? Caryn: Well, the simplest definition is that a boundary is a limit. It provides us with structure and order and safety in a world that can be quite unpredictable. Boundaries are everywhere; we take them for granted. We have physical boundaries that define the limits of my office, this building, this city; the physical boundaries remind us that there’s a separation between your chair and my chair, and between you and me—and that’s when it really gets interesting. We’re talking about personal boundaries and they’re harder to see but they’re also everywhere. They include relationship limits, role boundaries, emotional time, energy boundaries. You ask why we need them. Well, personal boundaries help us define what is physically or emotionally safe for us in any given moment. They are a necessary tool for our health. Jenni: Yea, you know I think there are a lot of people who, if we said that word to them, they wouldn’t exactly know what that means, but I love the idea of thinking that it’s something essential to our health. Caryn: Yes, for both our physical and emotional health and, of course, the interaction between the two. Jenni: So, can you give us an example of setting a healthy boundary around chronic illness? Like something someone might do to take good care of herself? Caryn: Sure! Let’s say your cousin, Shirley, is constantly giving you unsolicited medical advice, and it drives you crazy. Jenni: Yea, I think a lot of people listening have that example! Caryn: I’ve heard this come up many, many, many times. Every time you talk it’s the same conversation and it’s a shame because otherwise you love your cousin Shirley, so how do you respond? Well, you might get angry and make a snide comment, after thinking to yourself, you know, I’ve told her a hundred times, I don’t need her to be my doctor. This is obviously not a great solution. Or you might smile, nod and secretly plot revenge. Neither of these situations are obviously health-friendly or relationship-friendly. Now, setting a boundary in this situation means finding a way to respect your own preferences without sacrificing your health or your relationship with Shirley. So, one possibility is to recognize your own ongoing annoyance with Shirley just being Shirley. If you’ve already nicely asked her to stop the advice-giving, maybe find a way towards softening your heart to her. Remember, she loves you and this is her clumsy attempt of showing it. So can you just accept Shirley as she is? And then maybe you could ask her for her chocolate cheesecake recipe. Caryn: Well, it’s something else to talk about, without it being a fight. Jenni: That’s a nice idea. I love the idea of softening your heart to someone, because I think so many of us with chronic illness and chronic pain, I mean—you and I have talked about this countless advice or criticism or just weird comments sometimes from people who just don’t know quite what to say. Caryn: I think that’s very important, what you just said. People genuinely don’t know what to say and it’s an interaction to help them find a way to better communicate with you. Jenni: And I love the idea that you’re kind of turning it back by asking her for her chocolate cheesecake recipe; that’s so cool, because you’re turning it around and also bringing them into the conversation instead of it being one direction, like her just talking at you. It’s more of a sharing conversation experience, which to me sounds more pleasant and more beneficial to both people. Caryn: Exactly, because when we are talking about healthy boundaries, you know, it really is about a balancing act. It’s sort of, on one hand, how do you set this limit and on the other hand, how do you maintain the relationship. And it’s easy to get too focused on one of those sides. Jenni: Well that’s not the healthiest. I think some people listening to us talking about this might feel some resistance to this idea, because it means changing the dynamics of some long-standing relationships. I mean, some people, like my family, have known me my whole life and that’s been challenging for me. But I think it’s important to remember that boundaries don’t have to result in a negative outcome, right? They really can improve relationships for everybody involved. Caryn: Whether you set limits or not. The question is, do you want them to change in a healthier or unhealthier direction? It’s funny—it’s paradoxical—that setting limits can really allow for greater intimacy. Boundaries let you have more emotional safety and honesty. It helps you not to go where you don’t want to go. Remember, there is no intimacy when you have pent up resentment toward someone. That leads to poor emotional and physical health, and distances you from the other person. Jenni: Sometimes I’ve found that in those situations when I’m feeling really resentful, it’s almost like I cut myself off and I’m being less authentic with people. Jenni: I hate that; I don’t like to do that. It seems the opposite of how to have a good relationship with someone. Caryn: Right! And then you’re inadvertently disrespecting yourself and distancing yourself from the other person, so that’s kind of a lose-lose situation. Jenni: So, regarding when we’re learning to set some of these healthy boundaries: I know when I was first starting to think about this concept (which was many years ago) I kind of had the tendency to want to tell someone “I am setting a boundary with you” and I think that was an over-explanation. I don’t think I really needed to actually say that, as I did. What kind of language do you think we can use to set a boundary with someone without explicitly stating it? Caryn: It’s a good question. You know, overtly stating that you are setting a limit may be necessary, at times, especially if we are talking about violence or physical safety. But I’m not so sure that’s where you generally want to start. If someone said to you, “I’m setting a limit with you,” would you like it? Jenni: No, it would feel so uncomfortable. Caryn: Yes, not so much! There are more effective and friendlier ways of setting boundaries, so in general, the best language is assertive language. Language that is respectful of you and the other person. And so, for some of us, learning the language of assertiveness is almost like learning a foreign language. The thing to bear in mind is that it requires practice, practice, practice. Jenni: I know that from experience. I want people listening to know that this is not something I just sat down one day and talked with Caryn about and the next day—boom!—I was good at it. This is something I’ve continually worked on for years. Not to say that this is some agonizing process or anything, but it takes practice and sometimes it’s a big change for us. Caryn: Yes, and I really appreciate that you are emphasizing that, because what often happens is, you know, people will learn like five words in Spanish and then they expect that to be an excellent communication tool on their trip to Barcelona. You can learn a few assertiveness words or phrases with really negative results and come to the conclusion that boundaries don’t work or “I can’t be assertive.” So, there are some common pitfalls to look out for. Jenni: What are the kinds of things we want to avoid? Caryn: As you know, people who are newly attempting assertive communication may overshoot the mark and come across as aggressive. This is especially true if there are long-standing pent-up emotions. So, obviously, that’s backfired and other people believe that they can’t set a limit because the consequences could be so dire; they convince themselves that they can’t risk it. You know: So-and-so is going to hate me. So, yes, setting limits and being assertive: these are both skills to be learned and you want to start small and work your way up, so you can practice with anyone. You can practice at the restaurant; you can practice with your best friend. Practice with your best friend who loves you unconditionally. Practice with the taxi driver, a co-worker; practice until it feels more natural and you can find your own voice. Jenni: I remember one of the first things I did, that we talked about practicing, was sending a dish back at a restaurant that I didn’t think was cooked right. That was so hard. I felt like I was spitting in the face of the chef and the waiter to say that I like my eggs cooked a little harder, I don’t like them so runny, whatever, I can’t remember what I did. But I remember such a sense of achievement just doing that because I had really spent so long not feeling like it was OK to challenge people. Caryn: Exactly, and that’s half the battle, it’s putting yourself into those situations. Start with low-stake situations. Like, a restaurant or a shoe store or the bus driver. Start with something small. I think the main message to remember is that you really are practicing and that if you just hold on to the idea of respect, which is respect for yourself and the other person, it’s hard to go wrong with compassion and respect. Are there other ways we can set boundaries, like other behaviors that aren’t necessarily verbal or in the written word? Like instead of saying no, we write to someone? Are there other things we can do to set boundaries? Caryn: Absolutely. You know, just going back to cousin Shirley, what did we do? We practiced acceptance, compassion and non-engagement, and those are all internal processes that can keep us grounded, solid and clear about our limits. So, if you anticipate a problem, it’s important to be prepared. That’s what caller ID is for. Use it. Jenni: One of the best inventions ever! Jenni: That’s a good thing to remember. I am such a talker. I will talk for hours. It’s good for you to remind me of that along with everyone else. Caryn: Well, yea, that’s a common mistake that people make: they over-explain, they over-talk and then the message is confused. So if they just keep it to a couple of bullet points—and that’s the homework you would do upfront, if you can anticipate a difficulty. But also, even just having those words, you might also be prepared to use the so-called “broken record technique.” That’s where you keep repeating yourself in a calm manner until the other person doesn’t have a choice but to hear you, and that is very effective. Not an easy thing to do but sometimes necessary. If you want to be prepared, you can also stick to a timeframe. You can use a meditation timer or just decide there’s only a certain amount of time you are going to allow for certain conversations. Jenni: I love setting a timer like that. I think I have four oven timers or egg timers in my house. I have fewer phones now, but there was a time when I had a phone in every room and I had a timer next to every phone and sometimes I had a sticky note that said, like, if this person calls, don’t answer. Because when caller ID came out I would do that thing where I said, I’m not going to answer it if it’s them, but then out of habit, I would see it and I would still answer it. I sometimes had to get really literal on myself and have all these sticky notes and egg timers everywhere. Jenni: I’m sure people came over and were like, what is going on with Jenni and all her weirdness? Caryn: I think sticky notes are fantastic; I use sticky notes before I go in to see my physician, when I go in for a medical appointment I make sure I’ve got my bullet points because those are my needs. That’s what I need to get met and it’s just very easy to get caught up in other things and in conversations that may not be negative, but they are not what you are there for. Another thing: If you’re face to face, it’s important to be firm, and standing up to end a conversation can be pretty powerful. If you just keep moving toward the door, you know, extending a handshake, you’re setting a clear limit with that. Jenni: I did that this morning, in fact. I was having breakfast with my boyfriend and a friend of his who is visiting from out of town and I loved this guy immediately, but he has unlimited time today and I have very limited time this morning and he was just continuing to talk and I wanted to be there, but I really needed to leave. So I started to put on my scarf then I started reaching for my bag, and he saw that and went, “oh, you’re right, we’ve got to go.” I feel like that’s a boundary. And I think that’s maybe a misconception that I don’t want people to leave with; that boundaries aren’t necessarily like pushing people away, it’s more like taking care of the things that you need. Jenni: When I first started setting boundaries, I thought it kind of meant like, well, I’m building a wall against everyone or whatever… and that’s so not how you need to use them. I have set a boundary for myself for the past month where I only spend 15 minutes on email a day. For me, that’s like I am limiting my exposure and limiting my time, because I am protecting my time as a valuable resource so I can work on other things. It’s been great! Caryn: That’s the beauty of setting boundaries. You’ve discovered that and you raise a really important point: A lot of people think of boundaries as walls. It doesn’t mean drawing a line in the sand; when you think of setting a boundary in that way, you’re gearing up for a fight, which probably isn’t where you want to go. Jenni: I don’t think any of us wants to do that. So, we are talking about setting boundaries and I’m sure a lot of people right now are thinking about who they might try to set boundaries with and what they might work on. Do boundaries change over time? I mean, I feel like they do, but I’m just wondering how we know when to change the limits of a boundary? Caryn: Boundaries definitely need to change, because we change, relationships change… everything changes. I like to think of boundaries as needing to breathe; as we said, healthy boundaries are not walls, not rigid. You don’t need to put on a suit of armor because you are going into combat. That will leave you lonely and cold and uncomfortable. Boundaries that are too soft can leave you enmeshed with another person; you lose your sense of self, you’re naked, no protection. A healthy boundary is flexible and permeable, like a nylon stocking or a mesh tank top. Jenni: Mesh tank top! I always laugh when I think of the mesh tank top because it’s just such a funny idea. I like the humor aspect of it all. I’ll think of meeting with someone or talking with someone and imagine myself putting on a mesh tank top, which, in and of itself, is a great visual. Caryn: It’s a fashion mistake, but a relationship advantage! Jenni: I love the idea of permeability. I want to be able to let in the good stuff you love about someone like Aunt Shirley, her recipe is great, she probably has a great jewelry collection she wants to loan you sometime, and you want to get the that she has for you, but you want to block some of those things that you don’t like. Jenni: You don’t want to just stop talking to her altogether, but you also don’t want to let in everything because then there’s stuff that harms you. Caryn: And also bear in mind that sometimes things can get through that mesh tank top and it can hurt you. But again, it doesn’t have to be so extreme that it means you immediately need to rush to the suit of armor. Jenni, have you ever learned how to dance, like ballroom dancing? Jenni: I have, I took ballroom dancing when I was in middle school. Caryn: Perfect. I’m no expert on dancing, but I think dancing is all about boundaries. You have a partner; your partner is not you. And if you are a woman, usually you don’t even get to lead. But the beauty is, you learn to live in the moment. You don’t second guess your partner, anticipate or control their moves, you just relax and respond. You move forward, you step on a toe. Ouch! Sorry! Not Safe. Step back, not too far, not too close. You keep practicing and keep dancing until it feels more intuitive and you can experiment with a sense of kindness toward your partner, and a willingness to get it right. So, your dancing experience will come in handy. Jenni: Yea, wow, that’s such a great idea—I love that comparison. It makes so much sense. I’m totally envisioning myself right now in my poofy pink taffeta dress, with dyed-to-match shoes… and I had a perm, I mean this is middle school in Texas. And I had braces. Jenni: It’s such a great visual. So, in dancing, our partner might be more receptive or sometimes you get the geeky guy who has two left feet and he’s irritated because you aren’t doing a great job or whatever. I think in day-to-day life, some people are going to resist our boundary-setting and I’m wondering if you have any suggestions for how we can persist, because we know we don’t want to be bulldozed, and healthy boundaries are really important but some people are going to resist that change we try to enforce. Caryn: You’re absolutely right and so, in general, you want to start small and if necessary escalate, but your point is an extremely important one. It is really important to recognize that others won’t necessarily accept or understand our boundary settings. You know, if you’ve been saying yes for 20 years and then one day you say no, that takes some flexibility on the other person’s part. So not expecting an instant change from the other parties is really important. You also don’t want to start from a position of defensiveness. The other folks you are talking to are not opponents and you want to try not to view them that way. It’s not their fault you haven’t known how to set a limit for 20 years. Try to remember that the other party has their own fears, own frustrations and their own hurt and like you, they have both effective and ineffective coping methods. Try not to own their struggle and just focus on having compassion for both of you. Jenni: Hmmm, that makes a lot of sense. Caryn: It’s like you are juggling. One ball is the get-your-needs-met ball, the other ball is the maintain-the-relationship ball. And it’s very easy to drop one. It’s very easy to get your needs met at the expense of the relationship, and it’s very easy to maintain a relationship at the expense of your needs. The trick is keeping your eye on both balls. If you need to escalate, use the “broken record technique,” or disengage and politely end the conversation. End the conversation when it stops being productive and always come back to it, the emphasis is on politely ending the conversation. Because you won’t want to come back to it. Jenni: Also you won’t want to end that conversation with either party feeling negatively about it, like that was bad, I don’t want to engage with that person again. For example, if there is someone who, every time you talk with them, it’s just so negative you want to limit your conversations on the phone to just ten minutes. It’s really hard when that egg timer goes off, to be like, “I’m so sorry, I have an appointment” or “I need to end our conversation.” It can be challenging, they might feel hurt at first or challenged by that, but I think there is a way to do it and be kind of gracious about it. Caryn: Yes, I think if you can kind of capture the spirit of being gracious, you’ll get through this, one way or another. You can’t control how someone ultimately responds to your personal growth. Hopefully they can get with the program. But remember, especially if you have been saying yes for 20 years, the other party really has a disincentive for you to say no, because that’s really shaking thing up a bit. That can be challenging for everyone. Remember to have some compassion and understanding for that other person. This is going to be challenging for them too and that’s OK.
Jenni: Well, we’ve talked so much about what boundaries are and setting them, how we can work with people who feel resistance, how we can work with our own resistance. I feel we’ve covered so much ground, which is great. I was wondering if you have any last thoughts, maybe what do you think is the greatest benefit of creating healthy boundaries in our lives? Caryn: Well, it’s really hard to pick just one. Healthy boundaries offer you so much. They offer you less stress, more intimacy, more compassion, sensitivity for yourself and others—and with chronic illness, you already have challenges and struggles on a daily basis. The beauty of a boundary is that it can always be changed and it’s really only limited by your willingness to grow and change and learn. I’m reminded of a Native American saying and it says, “No tree has branches so foolish as to fight among themselves.” We’re all connected. Jenni: I think that dovetails really nicely with some of the other things we’ve talked about in some of the other lessons. If folks are not following along in a linear way, in Lesson 7, we talked with Dr. Val Jones about relationships, in Lesson 9 we talked with Jenette Fulda about communications and techniques, we’re talking with Dr. Steven Kvaal about negative thinking and turning bad habits into good habits, in Lesson 3… that involves a lot of communication and community building. All of those things are so critical to being a ChronicBabe, all that kind of connection and sense of community… from my experience, I just know they are essential. So these skills we have been talking about—I think that you’ve got to have them, they are worth practicing. I really appreciate all your time today and your ideas. I think you’ve given everybody a lot to think about. I’ve certainly learned some new things and that analogy with dancing is so incredible. Thanks for spending all this time with us today Caryn, I really appreciate it. Jenni: Cool! For those who joined us a little late, we’ve been talking with Caryn Feldman, PhD. She’s a clinical psychologist with the Rehabilitation Institute of Chicago, Center for Pain Management. She works with tons of people with chronic pain, really helping them manage their pain. We’ve been talking about boundaries. For those who are following along in a linear fashion, the next lesson is Lesson 5. It’s all about loving your body and I’m going to talk with Ev’Yan Whitney about sensuality and recapturing that, so that’s going to be an exciting chapter! I’m glad you were with us today, thanks again and I will look forward to talking with you all again soon.